Many preppers invest a lot of time and money into food storage. I have seen and read many instances where some folks have been able to accumulate as much as 50,000 pounds of food. Although this is admirable, and a good way to prepare, I tend to lean towards an old saying that says: “If you bring a boy a fish, you will feed him for a day. If you teach a boy how to fish, you will feed him for a lifetime.” Having a good supply of food is never a bad thing, but in a post- apocalyptic world you create the best chance for your long term survival by being well rounded in your ability to produce food. Obviously in the case of some type of infrastructure breakdown, you will no longer be able to head over to the local hunting store to pick up ammo, arrows, cover scent, etc. So it’s best to begin learning the hunting skills you’ll need in that environment now. Because it is more silent and will protect you from others hearing the shot in a way a firearm can’t, bow hunting should be a skill on every preppers list of ways to be prepared. Let’s start off with the bow itself. Most modern day compound bows are built to last with only one exception: the string. Learning to tie a bow string is easy and something that you can prepare to do on your own if need be. The basic tools you’ll need to accomplish this are a bow press, string, serving, and a serving jig. These items can cost you as little as $250 if you shop in a cost efficient way. Now that you’ve gone and bought these items, how do you learn how to string your bow? Well, the way I learned was to go to my local pro shop and ask to volunteer my time at their store in exchange for learning this skill. Big chain stores probably won’t be very willing, but small local outfitters are generally glad to help you learn this skill. In my mind that’s a good trade! Now that you have learned how to tie your string, the next thing to consider is arrow and broad head selection. Forget about arrow speed and all the other selling techniques in this modern fast paced society. Durability is your best friend as a prepper. When shopping for arrows and broad heads you’ll need to look for combinations of these two items that will get you more than one meal. I personally prefer to buy the Carbon Express Terminator arrows with G5 Montec broad heads. I choose these items for three reasons: durability, durability, and durability. Since I made this switch, I have killed two deer with this same arrow/broad head combo; and they are still in good enough condition that I will be nocking this same arrow this fall for a third deer kill. I chose carbon arrows first and foremost because they are durable, but, unlike aluminum arrows, they won’t dent or bend which can affect flight. I use the G5 Montec broad head because it has fixed blades. This is good for two reasons. One is that there are no moving parts that you would have to replace like on a modern mechanical broad head. Two, because it is a one piece design, it can be re-sharpened. So as you shop for these items, keep durability in mind. Last is scent protection. Sure there are all kinds of cover scents, scent controlled clothing, and attractants out there. Unfortunately those things probably won’t help you if there is no store to buy them from. So what should you do? Well, for a long time now I have lived by the campfire hunting method. Since electricity most likely will not be a luxury that we will have in a post-apocalyptic world, fires will be in use for many reasons. Because of this the smell of a fire will permeate the air. This will work to your advantage. Before you head out to hunt, stand by the fire so that you too will smell like the smoke that animals will become accustomed to smelling. This will make you virtually invisible to the keen sense of smell that most game possess. Now go ahead and cross scent free clothing and cover scents off your list. 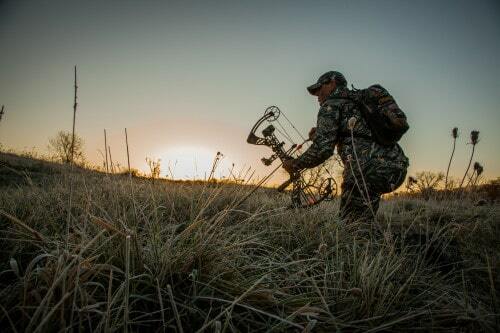 For attractants, you will need to be extra careful as you field dress your kill. If you don’t already know how to identify a critters bladder, take a little time to familiarize yourself with game anatomy. Now, when you go to field dress your food, it’s a good idea to have a little bottle or container on hand to harvest what urine is left in the bladder. Attractant scent problem solved. With these simple concepts you can give yourself the peace of mind to know that if something were to happen to your food stores, you will still be eating well and saving your bullets for the “zombies” that may be after your supplies. and lifestock such as rabbits, chickens, a sheep or pig would be a good combo. If one lives in an urban area even a few chickens or rabbits might be viable. If not then protein from beans and canned fish and meat would be good.Protein bars and peanut butter are also exc. I agree with Arlene & CM. I have a long bow and a crossbow. The recurve is on my radar. We used crossbows and other means for removing sentries and trail watchers in my day. Teaching someone to shoot is easier with a crossbow because of its familiar transition from long arms. Europe’s game animals became very scarce during the world wars. SP, I wander around in the woods at night with NVG to see what the animals are doing. Unethical in these times for hunting for sure but not if hunting for the pot in a grid down situation. I urge everyone to obtain night vision and use it. The variety of animal life out at night is amazing. I have a crossbow that looks like the one you have in the blind and modern recurve bows. Your point with broad heads are most valid. In an extended grid down, a wakizashi would be my constant companion as it is effective at close range against most beasts and being shorter is more maneuverable in the brush. Entropy happens and everything including our bodies eventually breaks. Capt. Michaels has a valid point about bows however I find most face a steep curve when learning how to stalk and hunt efficiently (quite different from the casual weekend hunt). Better tools brought to that learning environment eases the transition. Crossbows and compound bows (and of course firearms and NV) fall into that ‘better tools’ category. I submit that NV is a great equalizer. An inexperienced but motivated hunter with NV will likely be the equal of a superb hunter without. It is during the learning curve that such tools excel. In an extended grid down situation the NV equipped hunter will be bringing home game long after even experienced hunters fail. Having lived out of the barrel of my rifle for months on end in primitive environments, eventually I took on the scent of a beast (according to the wife who supposedly only glistened and would never sweat). Our odor certainly changed over time no doubt moderated by the wild, low fat, meat we ate. We stalked everything but leopard (hunted over bait from a blind) and I found that a talcum powder plastic squeeze bottle filled with fine ash left from the evening’s fire worked quite well for showing weak air currents, so essential to the effective stalk. As we were in an area with some of the world’s most dangerous predators, someone always was on overwatch after a kill with a rifle watching for whatever the smell of blood might draw. Field dressing a big antelope is hard work, butchering even more, making it hard to stay aware of surroundings, hence the overwatch. Again not a bad idea in a world without rule of law. Those of us who have hunted deer see how they take a bite, head comes up, ears and nose twitch, head down for another bite and the process repeats. One careful step is often possible when that head goes down. Apex predators we all are so living like that deer is not a bad thing as even this world is a dangerous place. I enjoyed the well thought out article and hope SP writes more. PR. What are your recommendations on a trustworthy NVG for people like me that are on a tight budget and can only afford around the $300 range or a little higher.